Once upon a time, Mary, Mary, Quite Contrary grew her garden with silver bells and cockleshells, but nowadays, most gardeners use some other forms of fertilizer that are better formulated than nursery rhymes. But what important components make up a fertilizer, and why are those components important for your plants? Without getting too technical, the three numbers show the percentage of available nitrogen (N), phosphate (P) and potassium (K) in a fertilizer blend. By law, it always goes in that order. If you see a fertilizer with 20-5-10, it means the fertilizer contains 20 percent available nitrogen, 5 percent phosphate and 10 percent potassium. Other nutrients and filler make up the difference and are often chosen for specific types of plants, such as roses or flowers, vegetables, trees, etc. Nitrogen promotes chlorophyll, producing greener, more quickly growing plants. If your plants aren’t as green as they should be, use a fertilizer with nitrogen. Most lawn fertilizers have a relatively high nitrogen content and cause mowing to be more frequent as lawns “green up” and grass blades grow more quickly. Phosphate improves root growth, flowering ability and bloom size. Use a fertilizer with a larger middle number (phosphate percentage) to encourage root growth during transplanting or to encourage blooms. This is especially important when initially planting so root systems become strongly established. Potassium enables the photosynthesis process and improves plant resistance to cold spells, drought and insect attacks. Many people use a potassium fertilizer when the seasons change to help plants resist the stresses of those transitions. Liquid or Granular? Fast or Slow? 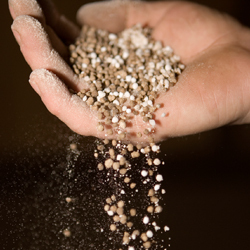 Fertilizers come in liquid and granular forms. Generally speaking, liquids are highly concentrated and need to be mixed with water before being fed to plants, but they are absorbed more quickly and are easy to apply more evenly. Granular formulas have small beads or grains that must be spread around and watered into the soil, and it can be difficult to spread an even layer over large areas unless a spreader is used. Granular forms need time to dissolve or decompose before they can be absorbed, but they last longer in the soil and can nourish plants for weeks or months. Similarly, fertilizers come in fast or quick release forms as well as slow release forms. Both can work well in any garden, depending on your fertilizing needs, plant nutritional requirements and condition of your soil. Read the label carefully for specific instructions and uses. It may seem boring, but reading that label will prevent bad results, as overuse or misuse of fertilizer can kill your plants, upset the balance of your soil and even cause environmental contamination – not the results you planned. Once you know more about fertilizer and how to use it correctly, however, you’ll enjoy the results this extra treat can give to your garden.